Sewing for babies is awesome. Especially if you find a pattern like this, that you can use as a blank slate for your creativity. With the plethora of possible fabric choices, from woven to knit, from jeans to quilter’s cotton, you can create a new look every time. The slouchy look is not just overly cute, but also incredibly comfortable. 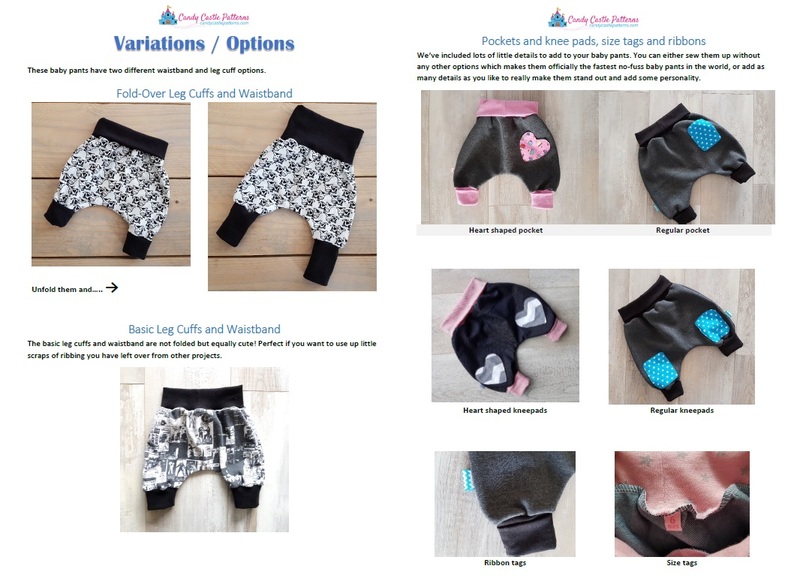 The fold-over waistband and cuffs (made from cotton lycra or rib knit) allow the pants to grow with your baby, and last a whole lot longer than just their size range. Of course, you can use the basic waistband and leg cuffs too if you prefer; we’ve included both in this pattern. These pants are amazingly quick; without knee pads or pockets you can create them fully on your serger and they whip up within thirty minutes, from cut to finish! This makes these pants the most perfect last minute baby shower gift and amazing to work up a wardrobe for quickly changing weather. You can keep these pants basic, or really dive into the details such as knee pads, various kinds of pockets, ribbon tags or other embellishments. Those knee pads are not just designed to look awesome; they will keep your crawling little one’s knees protected as they brave the challenges of your living room with their newly acquired skill of crawling everywhere! This pattern is suitable for both cloth and disposable nappies. Instructions are included to repurpose or recycle other clothing items you no longer need into baby pants. Think of daddy’s favorite baseball shirt from high school or that shirt with the most amazing print you just had to get from the thrift store. This pattern has a size range from Small Newborn through 18m. Basic sewing skills are all you need to create professional-looking pants. Tips and tricks for sewing with knits are included in the pattern. Using a serger is not necessary to use this pattern. This project can be completely made with only a sewing machine too. This pdf pattern contains layers. PDF Layers allow you to turn on and off pattern pieces, grouped per size. This way, you can choose to print one or more sizes you want to print, instead of having to print them all by default. This is a DIGITAL file that you print at home, not a finished item or a paper pattern. All seam allowances are already added. This pattern is for personal use only and may not be shared or forwarded with anyone else. TIP: This pattern pairs up perfectly with our Cute as a Cupcake Baby Collection! You can put the knit leftovers from this project to great use as you sew up booties, bibs, caps and mittens!